Along the way you'll see plenty of fantastic projects by the Odd Girls... we have been having SO much fun with this new line and are just bursting at the seams to share! We're bringing you 3 clear stamp set designs that we hope will knock your socks off and that you'll love for all sorts of projects. Turn of the century Art Nouveau has long been one of my most favorite art styles ever... especially the poster art that was made popular during that period in history. So when Kristy sneaked that she was going to add some Nouveau style girls to the SOG line all those months ago, I was totally psyched! My card today features the Believe Nouveau Girl along with the flowers and leaves that also come with her on the small set. Isn't she enchanting? I love the dreamy look on her face and those flowing robes are so much fun to color! 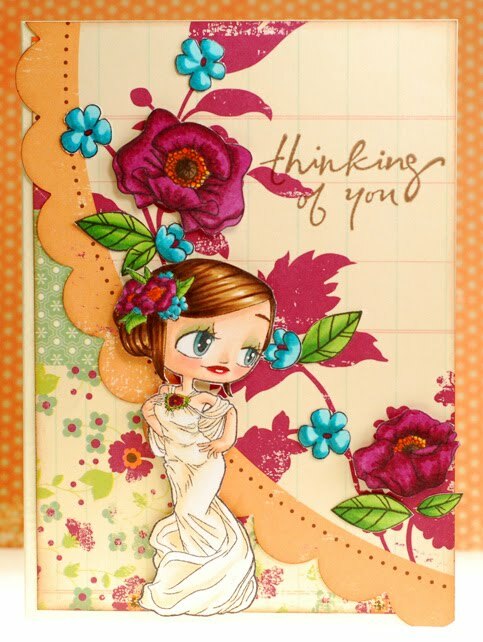 I colored up the extra poppy stamps to match the vines in the pattern paper and used them along with the leaves and smaller flowers to embellish the rest of the card. 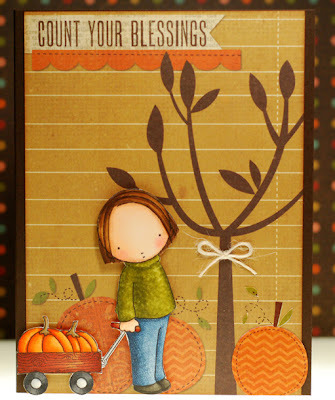 We are hopping October 31 - Nov 1 with some special projects on the brand new Nouveau Girls Blog the rest of the week. You have thru Nov 1st (midnight EST) to make sure and comment on every stop to be entered to win all three designs from the release! Are you ready to bundle up and make the journey back into Sweet November Land? The inhabitants of this magical place are still getting ready for a very special holiday season and the fairies, elves and sprites are getting help from some seasonal visitors that only appear once the first snow covers the land. Sure, this time of year it is fun to roll that snow and stack it high into a snowman or two but in Sweet November the snowmen come to life! It's easy enough to find them, all you have to do is follow the wide paths that they leave as they shuffle to and fro. The Wish U. Goodcheer candy kit includes; one Sweet November Wish U. Goodcheer rubber stamp, twelve 6x6 sheets of My Mind's Eye Christmas Kitsch paper, small Studio G acrylic stamp, Prima flowers, Kaiser Craft pearls, ribbon, twine, buttons, punched snowflakes, four envelopes, four card blanks and my card. The candies will stay open through Friday, November 4th and I will announce the winners on Saturday, November 5th. And just so ya know... the November release stamps will be available for purchase over at ATS on the 4th! 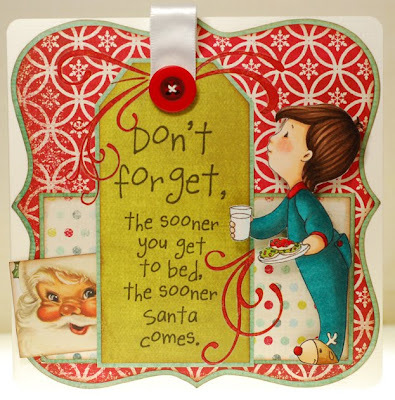 Alrighty, now be sure to visit the Sweet November Gals' blogs for even more cheery and chilly cuteness! Today Jacilynn is joining Nancy and Rachel and I promise that you won't want to miss a single card! Well that's a wrap on day one of our November SN previews... I hope you have enjoyed meeting this first sweet snowman friend and don't forget to come back tomorrow to see who else has arrived with that magical Christmas snow! Sweet November Spotlight on Jacilynn! It's almost time to start previewing the new Sweet November stamps for November. Before we meet those cool holiday friends I want to shine the Sweet November Guest Gal spotlight on a very special bloggin' pal... please say hello to Jacilynn Dashwood! Jacilynn's style of cardmaking is a bit CAS and a bit fun and funky all mixed together. She has a jazzy way of using and combining colors that always makes me smile. Her mini masterpieces are fresh and vibrant with a color story that enhances whatever image she may be using. I guess what I'm trying to say is that her work has a sense of overwhelming happiness. And I am so excited to have Jacilynn joining us this month! My favorite color is pink and it just simply makes me happy to look at it. But I think Red most represents my personality. I'm passionate about the things I love. I either love something or hate it...no middle ground for me. If I eat something good I'm gonna be telling my friends "You have got to try this, it's amazing!" I really over use the word AMAZING. Yes, I love bright bold colors for my dress, home, and card making. I like things to look good without "trying to hard." So I lean toward a CAS card style. I also don't like to fuss so most of my cards are 4x5 so I can mail them easily. Strike the word "always" substitute "frequently and my answer is my Kids. I have some seriously funny kiddos. And I really love being a Mom, it's the best thing I've ever done. I'm a huge Jane Austen fan, so I would have to say when she was alive. I'd love to have a conversation with that woman. I'm also a huge Harry Potter fan so I'm gonna say witch because who wouldn't want to be magical? I would be like Mrs. Weasley, using my magic to clean my house. I am a Gleek! I love that show. I don't necessarily identify with any character in particular but I love them all. I love their flaws and eccentricities. I love rooting for an under dog. Well, I totally scored at the crafty store yesterday. While I was browsing the Christmas aisle of paper and goodies I came across two different paper pads by My Mind's Eye that I had never even heard of or seen promoted anywhere before. I was shocked I tell ya! There was a 12x12 pad called Christmas Kitsch and a 6x6 pad called Merry Little Christmas... both of which are supah cute and thanks to some 40% off coupons, one of each came home with me! Woot woot! But before I jump head first into Christmas cards, I've still got one final Halloween card to share this year. I wanted to go with something sweet and cute so another Pure Innocence cutie came out to play, Little Witch. And instead of going straight to the Halloween papers I went with some random orange paper scraps. Just by adding in the bit of green and black with the touch of purple in her hair adds enough of the Halloween look I think. Her dress is paper pieced and I did add some orange shading to it to help give it some dimension as well. All in all, a fairly simple and pretty little card for my 'pretties'. So this quickie card came together completely different than I had originally planned. 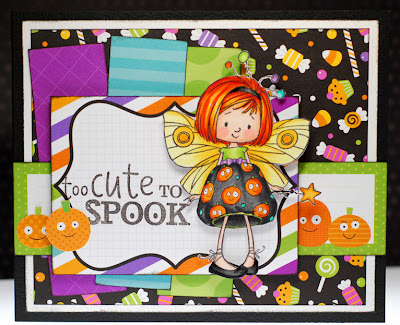 At first I was all set on making another Halloween card for today's post but when I was flipping through my Pure Innocence stamps this adorable little pumpkin patch gal caught my eye instead. Sure, I could still make that work for a Halloween card... kind of like the day before Halloween when she is gathering up all her pumpkins to carve. But when it came time to find some papers that would work I pulled out this Simple Stories Year-ography pack that I got in a recent order and that's when the new direction hit me. I mean, how could I resist using that 4x6 piece of paper when it practically takes care everything (embellishing, color palette, sentiment...) leaving only the colored image for me to do? Awesome! Alrighty, time for me to hit the road. Have a good one! Boy oh boy has it gotten cold here quickly! Just a few nights ago we were hovering in the low 40's then all of a sudden we were below freezing by 10 pm. Yesterday was cold all day long and I'm worried this might be a sign of an early winter... yikes! I'll keep my fingers crossed that the dreaded white stuff holds off on making an appearance for a few more weeks, LOL! 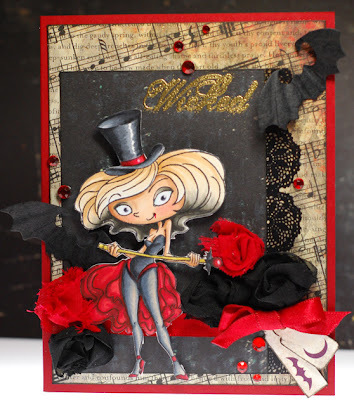 Alrighty, so go check out all the amazing inspiration from the design team girls and play along with us this week. There is a free digi of your choice up for grabs and the winner is now selected by random generator! Don't forget that your card must feature a Tickled Pink stamp in order to qualify for the prize... these include: Lil Lolitas and Lads, Pinkettes, Pink Pets and Cherries. All of which can be found in the Tickled Pink store. 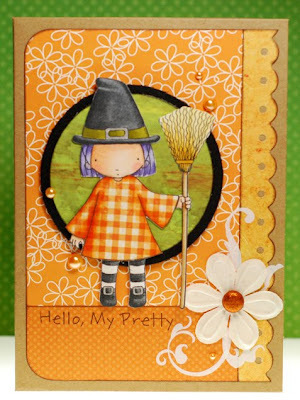 And don't forget that Tickled Pink has their digital stamps available during the entire month of October! Soooo... I got some new Sugar Nellie stamps in the mail recently and I've just been itchin' to ink them up. But time and again that has kept getting put off for other things so they had to sit and wait, it was torture I tell ya! ETA... this week's Flutter By challenge is to use the colors; black, purple, orange, and green on your card so how perfect is that?! Looks like I'll be poppin' this card over there to play along! Ok, time for me to go get ready for the day. 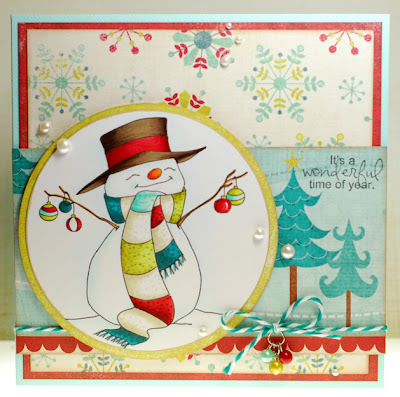 It's another review preview day over on the ATS blog and today it's all about the Christmas Fairwees! And I love pairing her up with the mistletoe cutter because it saves me a ton of time not having to try and fussy cut all those little branches and leaves. All I have to do is snip off the stamped mistletoe, glue the diecut one in its place and add pearls for the berries... easy peasy! 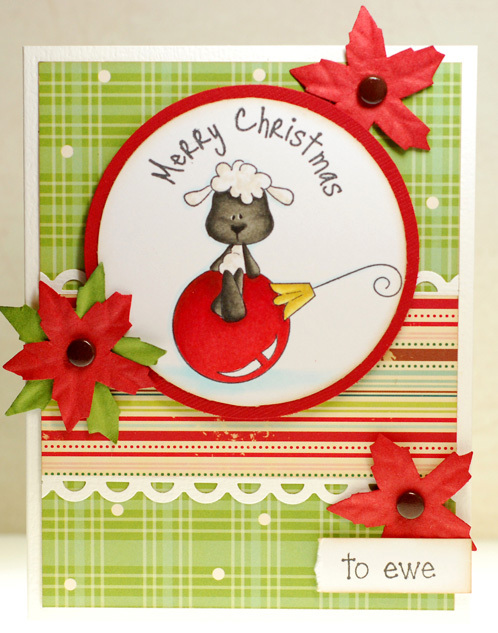 Sweet November Gals, Danni, Nancy and Rachel, along with some of the ATS team all have wonderful Christmas Fairwee cards to share, so don't miss checking out all of their fab creations too! I finally made it to the last (but not least) of the Halloween images that I had started during past coloring videos. 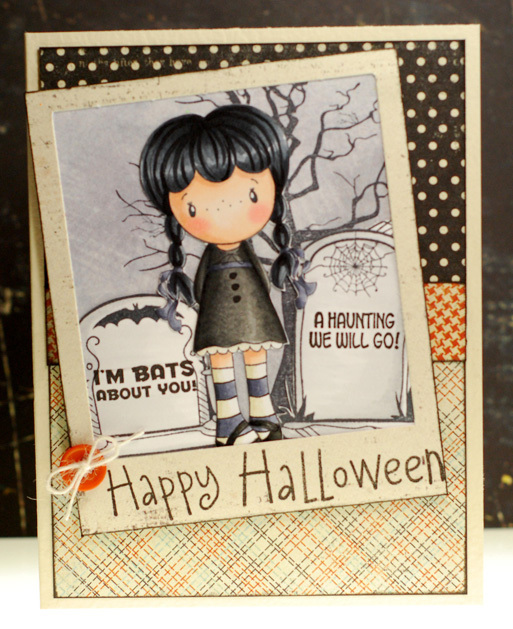 This little cutie is Miss Rosalie from CC Designs and I used her in my 'black hair and black clothes' tutorial. I was going for a kind of Wednesday from the Addam's Family type vibe with her and new from the get-go that I wanted to pair her up with these fun tombstone stamps that I got this year. They are a clear set from Inkadinkado and they originally have text in each of the tombstones... none of which are ones I saw myself using much soooo... I grabbed a pair of fine tip scissors and carefully cut the text out of each stamp. Now I have six blank tombstones that I can add anything I want to them, which is great! And how cute is that Polaroid frame? I was using up more Mischievous scraps on this card and came across the die cut sheet that goes with the line. As soon as I saw this frame I knew just how I wanted to create Rosalie's scene. 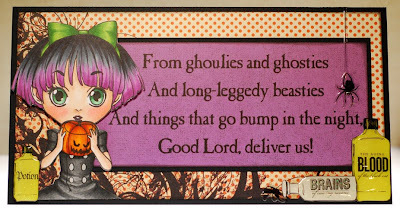 I like how it contains everything and looks like Pugsley or Cousin It took a snapshot of her in the graveyard on Halloween night. 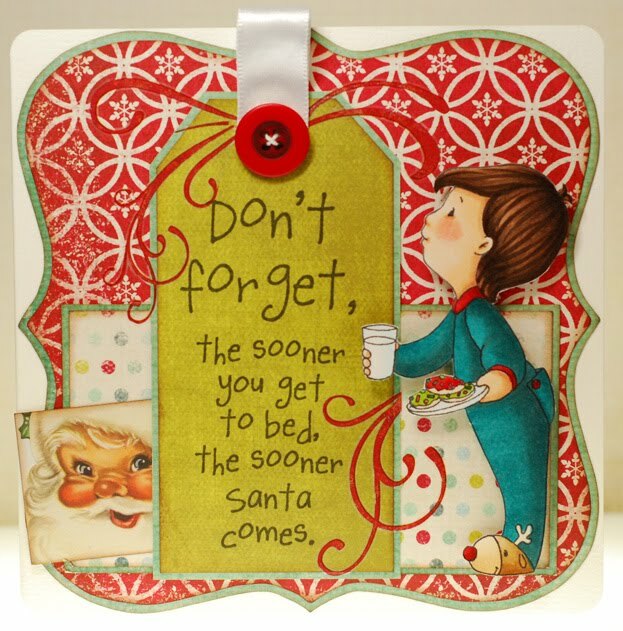 And the added bonus is the perfect little place that it provides for a sentiment... love it! I'm thinking I may need to make some of my own frames like this because it would be super easy to do. Alrighty, time for hair and make-up. Well, I'm getting down to the last few remaining Halloween stamps that I had started during past videos. And when I saw the new sketch challenge over at Kraftin Kimmie's I figured it was the perfect time to finish coloring up Monique from my two-toned hair video. Well that's it from me today... toodles! So I'm still making headway on getting the images from past videos off my desk and onto cards. I'm determined that I'll have all the Halloween ones done before Halloween actually comes and goes, LOL! 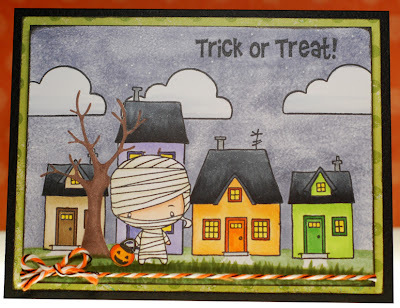 Today I've got the Spooktacular Mummy from TGF all colored up along with the entire scene that I created when I did the masking video a while back. This one is really all about the coloring so not a lot of paper or embellishments fussing it up. The sky is colored with Copic marker BV23 and then to smooth out the streaks I just put some colorless blender on a scrap of terry cloth and dabbed it all over giving it a nice mottled appearance that looked much more sky like. If you try this technique just be sure to do that step first so that you don't accidentally dab colorless blender all over the parts of the scene that you want to stay smooth, like the houses and that cute mummy here. I also drew a small candy pail for the little trick or treater to really finish off the entire scene. So I've had some requests recently to share how I color up furry characters, specifically little Joe Joe the werewolf. And since I had some time yesterday afternoon I went ahead and shot a video of just that. 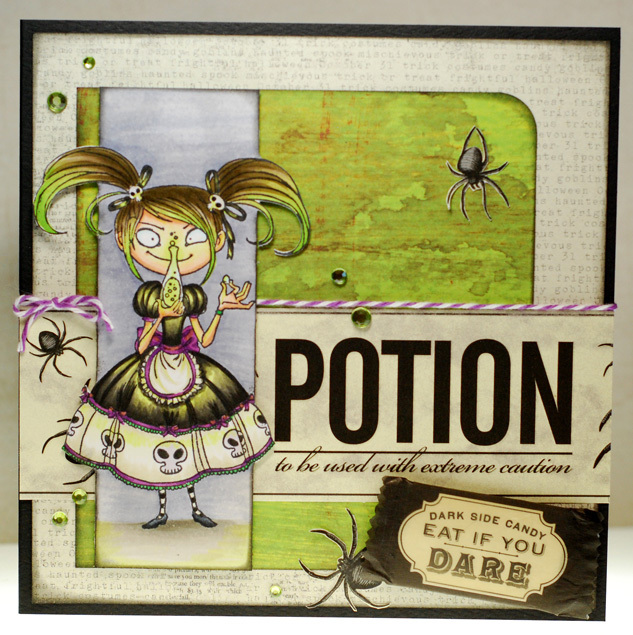 You can catch it here or on the Color Me Copic blog... hope you like it! Ok, so I've got to make like a banana and split... have a good one my friends! It's time for a new challenge over at Some Odd Girl and this go 'round we want to see you color your stamped images completely in black and white! That's right, just think of it like you are creating a cool black and white photo or movie still... everything is in shades of gray. No skin tones, no red lips, no blue eyes, everything that you color has to be black and white. You can still go crazy with color on the rest of your card design so that the entire card doesn't have to be completely monochromatic. I mean, come on?! Isn't she fabulous? This new Mae so reminds me of a vintage Halloween pin-up with her flirty pose and ooh la la ensemble. I just love her to bits and am keeping my fingers crossed that we see some more SOGgies like her in the future. Okey dokey, so now it's time for you to get inspired and show us your black and white coloring skills! 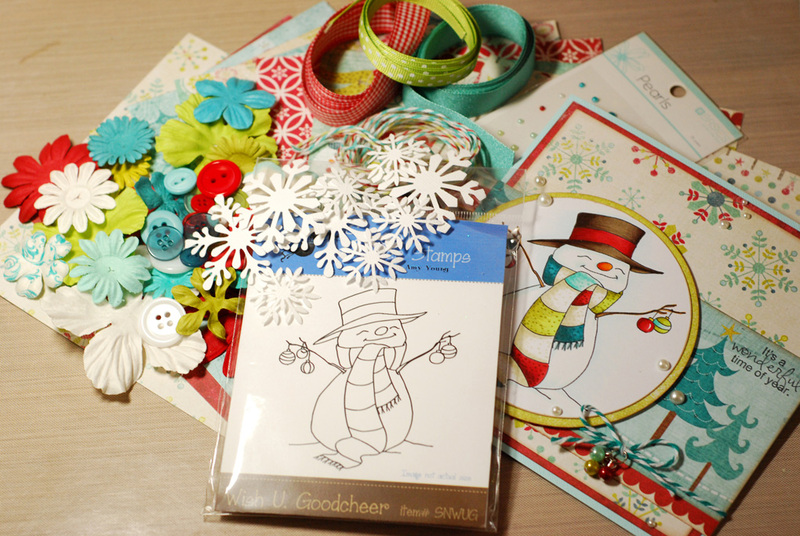 You've got until November 1st to enter a card for a chance at winning a fab prize and while you don't have to use a SOG image to qualify, you do get an extra name in the hat come drawing time if you do. 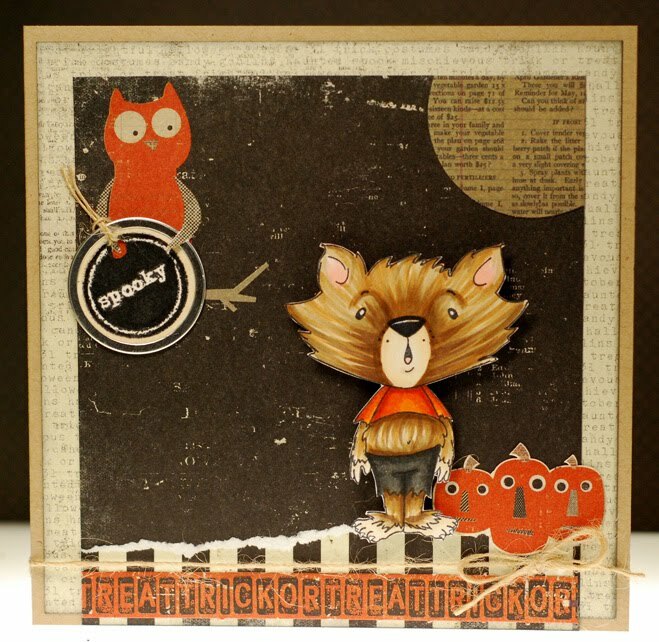 So today is a new post over on the ATS challenge blog and we are playing with a great sketch by Rachel this week. 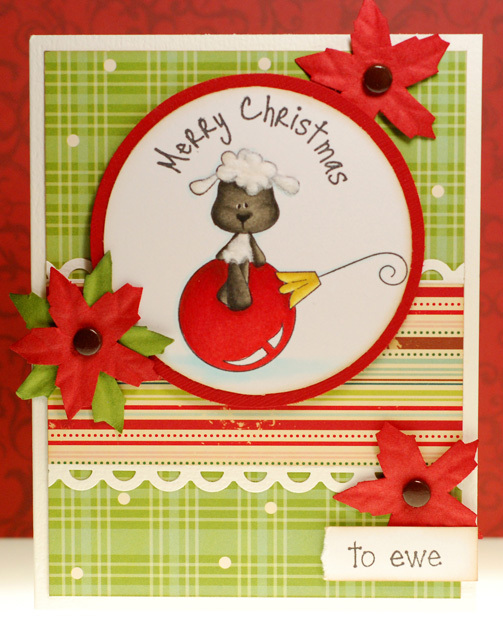 I thought it would be fun to do a bit of altering with the new Tree Trimmers Christmas Fairwees for this card. So I broke up the duo by only inking Daphne and a few of the kernels and berry trim. Then I stamped up some extra berries and popcorn kernels from an older October Afternoon stamp set that I have and added them to Daphne's garland strand. After all that work she and Jilly did creating these lovely decorations, Daphne just couldn't help sneaking away for a quick nibble or two of that yummy popcorn... and I can't say that I blame her one bit, LOL! I did make some progress with the craft room clean up yesterday but there is still a ways to go. But for now that will have to wait as it is back to work for me today. 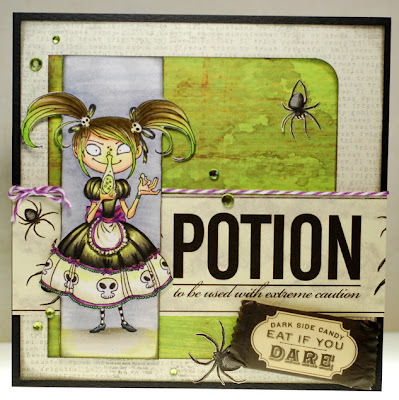 So this card features Perfect Poison from Kraftin' Kimmie Stamps and even though I've had her since last Halloween, this was my first time actually inking her up... tsk, tsk! To be honest I think I was a bit intimidated by her. I didn't quite know how to approach that bubbling potion she's holding but once I thought about it I decided to treat it kinda like candle glow. So instead of yellow highlights I went with an appropriately eerie yellow green light being cast from the bottle. I gotta say, I think she turned out quite sinister looking in a quirky, cute kind of way, LOL! There are so many fantastic images to choose from within the Tickled Pink range that I had a hard time narrowing it down. In the end I let the time of year and upcoming holiday help me to decide and went with the very cool and very gorgeous Lil Haunt Ghost Willow. 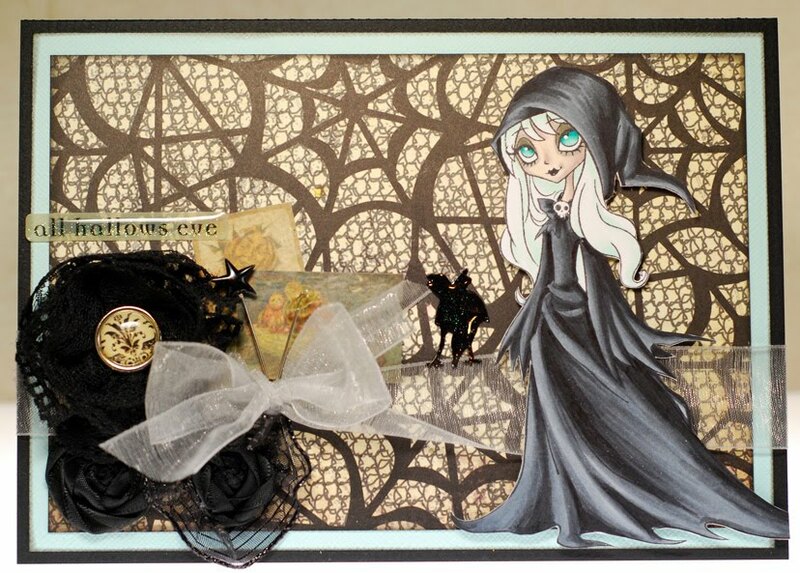 For this card I saw her as more of a Goblin Queen than a ghost so I colored her up nice and spooky like with piercing blue eyes and a sweeping ebony gown. 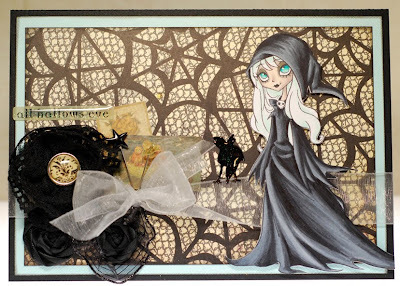 Then I felt uber crafty and made some haunting ribbon roses to go with her. 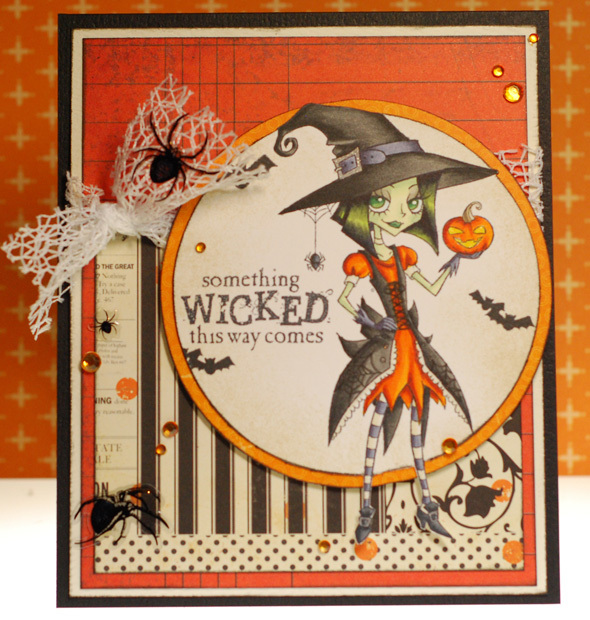 Halloween cards are just way too much fun to make! I still haven't come up with any big plans myself but I do want to tackle the state of my crafty room. Ok, I'm wrapping this one up now and heading in to my room to continue clean up then hopefully get creative and start the vicious cycle all over again, LOL! Sweet November Spotlight on Danni!